This article describes view state and shows with an example how view state works in ASP.NET. View State is the method to preserve the Value of the Page and Controls between round trips. It is a Page-Level State Management technique. View State is turned on by default and normally serializes the data in every control on the page regardless of whether it is actually used during a post-back. A web application is stateless. That means that a new instance of a page is created every time when we make a request to the server to get the page and after the round trip our page has been lost immediately. It only happens because of one server, all the controls of the Web Page is created and after the round trip the server destroys all the instances. So to retain the values of the controls we use state management techniques. Now I am explaining what View State is. View State is the method to preserve the Value of the Page and Controls between round trips. It is a Page-Level State Management technique. View State is turned on by default and normally serializes the data in every control on the page regardless of whether it is actually used during a post-back. Now I am showing you an example of what the problem is when we don't use view state. Then click on "New Project" > "Web" >"ASP.NET Empty Web Application". 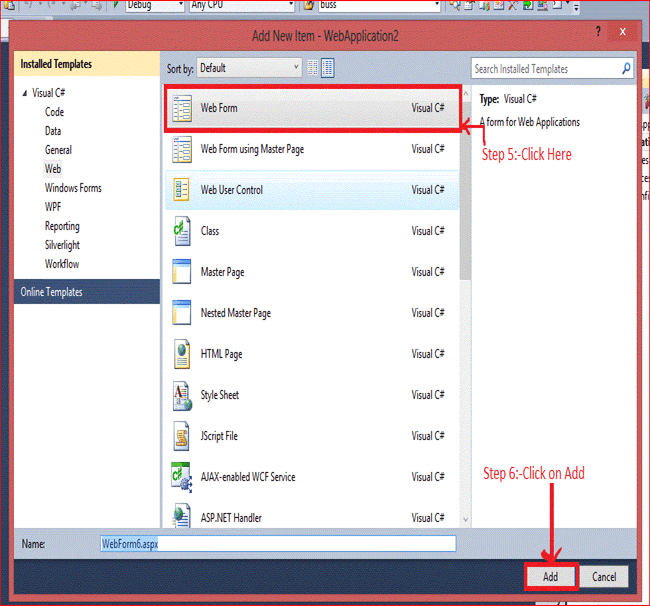 Now click on Solution Explorer. Now right-click on the "ADD" > "New Item" > "Web Form" and add the name of the Web Form just like I did in WebForm6.aspx. It only happens because all the controls are classes and on the server all the Control Objects are created and then after the round trip the Page is returned to the client's browser in HTML format and the objects are destroyed at the server. After the Submit button is clicked the value of user name and password is submitted to the server. We cannot restore the value again because after the postback the instance of the control is destroyed and on clicking of the Restore Button the server takes a new request and the server cannot restore the value of the TextBox. And now I am explaining the stored value in the View State and the remaining steps are the same as the previous. After clicking on the Submit Button the value of user name and password is submitted in View State and the View State stores the value of user name and password during post-back. After click on the Restore Button we can get the value again. The Value must be retained during post-back and the values are stored into a base 64 encoded string and this information is then put into the View State Hidden Field. No server resources are required: The View State is contained in a structure within the page load. Enhanced security features: It can be encoded and compressed or Unicode implementation. Security Risk: The Information of View State can be seen in the page output source directly. You can manually encrypt and decrypt the contents of a Hidden Field, but It requires extra coding. If security is a concern then consider using a Server-Based state Mechanism so that no sensitive information is sent to the client. Performance: Performance is not good if we use a large amount of data because View State is stored in the page itself and storing a large value can cause the page to be slow. Device limitation: Mobile Devices might not have the memory capacity to store a large amount of View State data. It can store values for the same page only. When the data to be stored is small. Try to avoid secure data. You can enable and disable View State for a single control as well as at the page level also. To turn off View State for a single control, set the EnableViewState property of that control to false. For enabling the same, you need to use the same property just set it to "True". Always: Encrypt the data Always. Never: Encrypt the data Never.